worsted weight yarn in white, red, and blue. Not sure how much of the white yarn I used, but I would estimate maybe 80 yards? The red and blue were just scraps. WNKS- wrap next stitch: turn the work, then slip the first stitch on the right hand needle to the left hand needle. Send the working yarn back between the needles, then slip that unworked stitch back onto the right hand needle. Then bring the yarn forward to purl. WNPS- wrap next purl stitch: turn the work, then slip the first stitch on the right hand needle to the left hand needle. Bring the working yarn forward between the needles, then slip that unworked stitch back onto the right hand needle. Then send the yarn to the back again. K2tog- knit the next two stitches together. 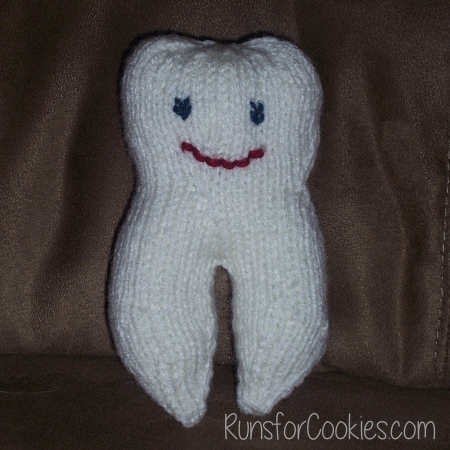 KWS- knit wrapped stitch: insert your right needle under the "wrap" first, then the stitch that it is wrapped around. Knit them both together. Provisionally cast-on 40 sts, divide evenly on dpns, and join to work in the round. PM to mark beginning of each round. Rnd 6: *K8, K2tog* Repeat from * around. Rnd 8: *K7, K2tog* Repeat from * around. Rnd 20: K the first 20 sts with the circ needle (or use dpns and slip the 20 sts onto a stitch holder or slide a scrap piece of yarn through the sts) Let these hang around, you'll be working them later. K the last 20 with the dpns--you'll be working these sts now. CO 2 sts, and join into the round (22 sts on the dpns now). Rnd 3 (short rows): K18, WNKS. P14, WNPS. K9, WNKS. P7, WNPS. K7, KWS, K4, KWS, K3 (you should be at the end of the round now). Rnd 4: Knit, KWS as needed. Rnd 9: *K3, K2tog* across. Rnd 12: *K2, K2tog* across. Rnd 14: *K1, K2tog* across. Rnd 15: Knit. Break yan, and thread remaining yarn through sts and pull tight. 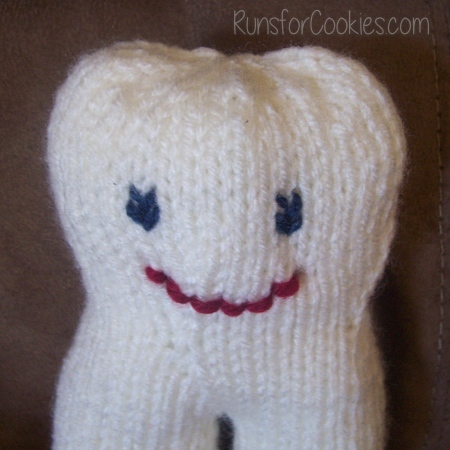 Using the stitches from the circ needle (or holder) join yarn and knit around. CO 2 sts and join in the round. Repeat rounds 1-15 above. Sew the opening between the legs. Rnd 2 (short rows): *K14, WNKS, P8, WNPS, K8, KWS*, K to middle PM. Repeat between *, then K to start of round (KWSts as needed). Rnd 3: Knit around, KWSts as needed). Rnds 4-5: Repeat rnds 2 and 3. You may want to stop here and fill the pillow with the batting before going on. I used a pencil eraser to stuff it into the "legs". Rnd 6: *K2, K2tog* around. Rnd 8: *K1, K2tog* around. Rnd 9: *K2tog* around. Break yarn, and draw through remaining sts. Make sure you have as much stuffing as you want, then pull tight and weave in ends. CO 10 sts with red (or whatever color you want). Repeat for 7 rows. BO. 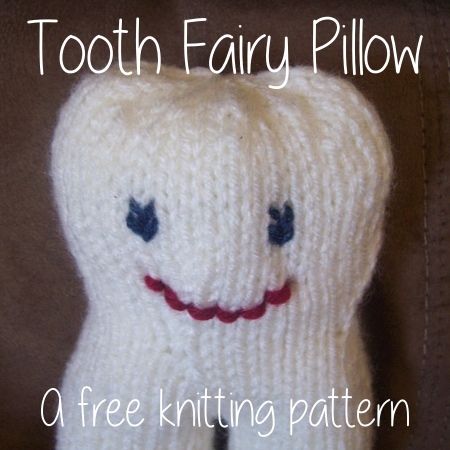 Sew the pocket onto the tooth pillow. 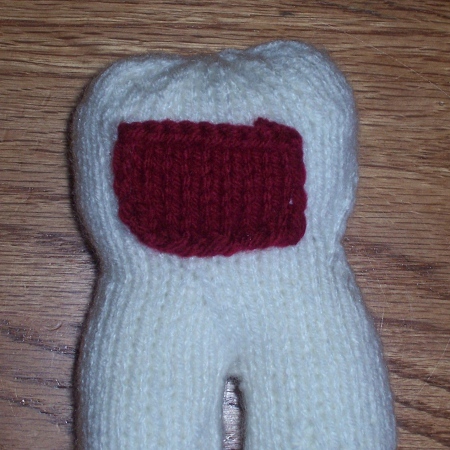 For the face, you can embroider eyes and a mouth (I just used scrap yarn for this).